It has been a year of firsts for the TRU men’s basketball team and that trend continued this past weekend when a pair of wins helped them book the program’s first ever ticket to the Canada West final four. It didn’t come easy for the ‘Pack as they were stretched to the limit by a strong University of Regina Cougars team, with the best-of-three series staying close right down to the final buzzer. 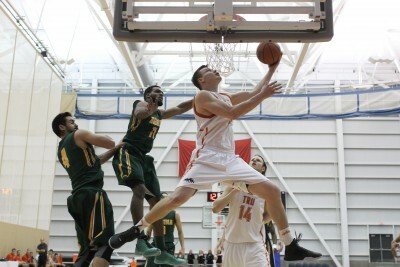 The series got underway Thursday night and it was Regina that would take the opening game by a score of 102–94. The story of the night was defence, specifically TRU’s struggles with keeping the Cougar’s high powered offence in check. The ‘Pack committed to playing a zone defence in the match, a strategy that leaves space on the perimeter and dares the other team to beat them from the three point line. Unfortunately for the ‘Pack the Cougars were able to do just that. “When you give up 60 points in the second half you know you aren’t going to come away with a victory. I have to give Regina credit, they did shoot the ball (well),” said head coach of the ‘Pack Scott Clark after the loss. With their backs up against the wall in the Friday night match-up TRU was able to pull out a victory to extend their season, they took down the Cougars 90–85. With the defence playing better, TRU was able to jump out to an early lead thanks in large part to the play of Volodymyr Iegorov. The Ukrainian forward led the ‘Pack with 32 points on the night. With Regina battling back TRU was able to make clutch-free throws down the stretch to clinch the win. In the third and deciding game, TRU, despite a late surge from the Cougars, was able to hold on for a 86–73 series-clinching victory. For the second game in a row TRU jumped out to a large lead early, but yet again the Cougars showed great resilience to battle back and keep the game close. Coming up big in what could have been the last games of their CIS careers were Reese Pribilsky, who scored 27 points, as well as Josh Wolfram and Gerard Gore who each chipped in 15 points of their own. Basking in the afterglow of the victory, with the fans still cheering in the background well after the game was over, fifth-year player Gerard Gore talked about how he was able to play his best game of the series when it mattered the most. “I just came out and decided that I was going to do everything possible to help the team. I’ve struggled with foul trouble the past two games and I came out poised and ready to do whatever I can to help the team out,” Gore said. While most of the scoring throughout the series was put up by the veteran players on the ‘Pack it took a full team effort all season long to achieve everything that TRU has this year. “This is a big step for us, last year we fell short. The three seniors: myself, Josh (Wolfram) and Reese (Pribilsky), we came out at the start of the year and pushed the younger guys. We told them that we’ve been getting better every year and they followed us, stuck around and we’ve all done a really good job all year,” Gore said. TRU now heads to Calgary for the Canada West final four where they will do battle with the University of British Columbia, and either the University of Calgary or the University of Manitoba. When asked if his team would have a chance to soak in the glory after Saturday’s dramatic victory Clark’s mind was already focusing on the next task at hand. “It’s a little celebration but it’s more just a time to take a breath. Take Sunday off and Monday we’ll meet for some video, practice Tuesday, Wednesday, a walk-through Thursday and we’ll get set to play Friday and Saturday next week,” Clark said. 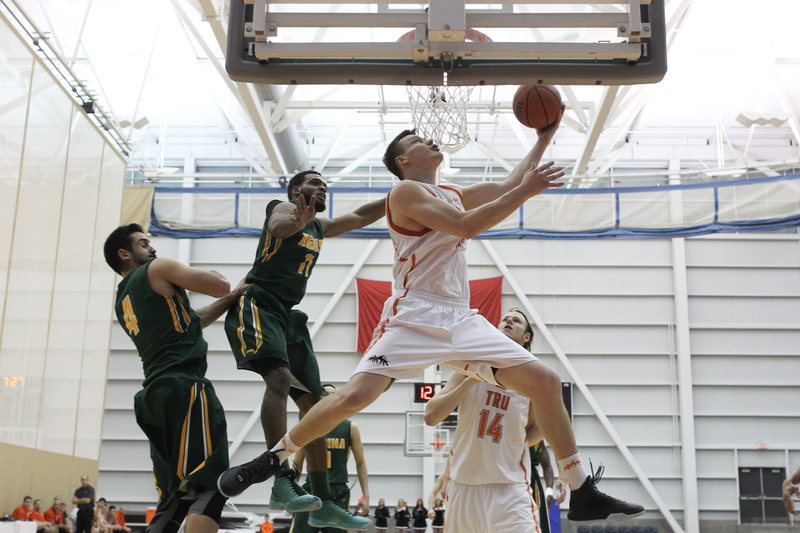 With UBC hosting the CIS final eight national championships in late March, the Canada West conference will most likely send three teams to the tournament. A strong showing this weekend could continue TRU on the record-setting path they’ve been on all year with a first-ever berth to the national championship. TRU is back in action Friday night with a game against the UBC Thunderbirds.